American Crocodiles were once found from Lake Worth to the waters in and around the Florida Bay. Most now nest in the Crocodile Lake National Wildlife Refuge in Key Largo, in the Everglades and on the berms of the cooling canals of the FPL Turkey Point Plant. Crocodiles prefer the quiet waters of coastal mangrove swamps where they are protected from onshore winds. Light Tan Crocodile (no longer available) is shown at far left. 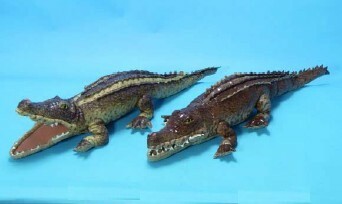 Dark Tan Crocodile (NP8012B) is shown at near left. Both are 42 inches in length. Ernie (short for Erstwhile) has always been a history buff. In fact his name "Erstwhile" means 'belonging to some prior time.' And what a history he has to be proud of. Crocodiles are the largest reptiles on earth. The African or Nile crocodile is one of the biggest growing up to 18 feet long. This is huge, but compare it with one from the Cretaceous period that grew to a gigantic fifty feet long. Such behemoths went the way of the dinosaurs but their smaller brethren live on. 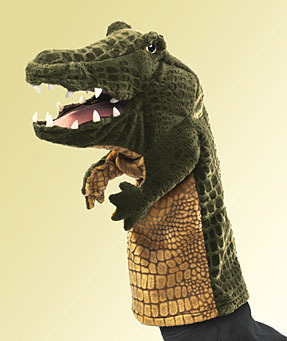 Our Crocodile Hand Puppet is only 13 inches tall. Good thing too.